There’s an international ‘Putin the Peacemaker’ poster movement underway and it could be hitting a wall or bridge near you. Vladimir Putin fans hit Manhattan first on Thursday, when they erected a 20 by 30ft poster of the president’s face on a Russian and Syrian flag backdrop with the subtle caption, “Peacemaker”. Сирийские студенты, обучающиеся в столичных вузах, вывесили баннер «Путин, спасибо за мир» на Крымском мосту. 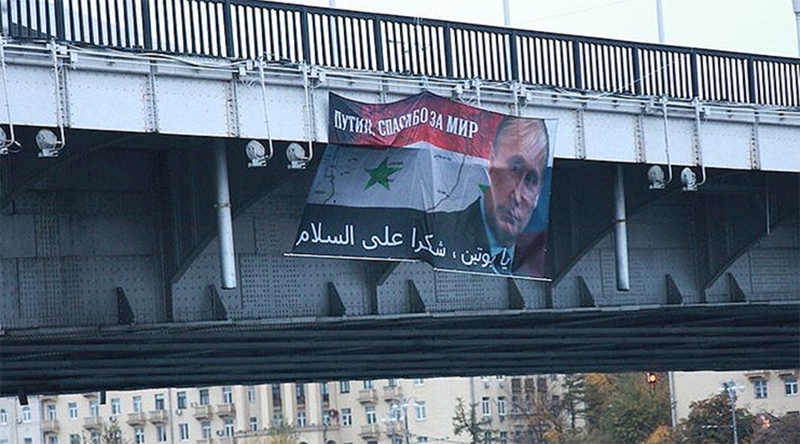 This isn’t the first time Russians have celebrated Putin’s birthday with a huge bridge poster. A huge banner depicting a joyous Barack Obama wearing a ‘Happy Birthday’ t-shirt appeared in Moscow in 2014. @SlonMagazine@tvrain Another desperate try to distract from Putin birthday? The next target for Putin’s poster army emerged Friday morning in Germany’s Dresden. A life-size picture of Putin marked “Peacemaker” appeared on the side of the building where the Russian leader supposedly lived in the late 1980s while working in the KGB. What spurred the spike in international Putin appreciation is anyone (and everyone’s) guess.